William enlisted at Huntly in October 1914 and arrived in France on 10th March 1915, the day the five day Battle of Neuve Chapelle started. 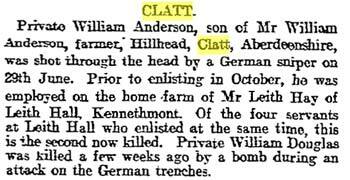 It is likely that William and James Daun left Leith Hall, enlisted together at Huntly and trained together. Both arrived in France on 10th March. As part of a new draft they may have gone straight up to the front to join the battalion, with the British Expeditionary Force, in the field. William's cousin L/Cpl George Anderson, Mosstown, had been out at the Front with the 6th Gordons since Nov 1914. The 6th were next into action in the attack on the German line in front of the village of Festubert, 16th-18th May and the action at Givenchy the following week. 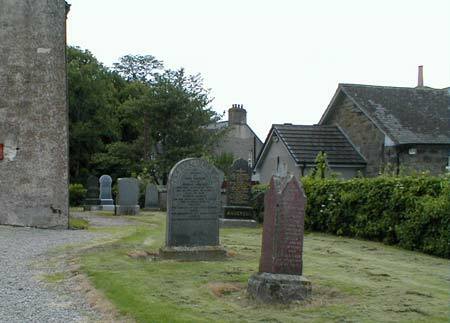 It is known that before and after Givency the 6th Gordons were in the line at Windy Corner near Cuinchy. William was hit in the head by a German spiper's bullet and it is likely he received treatment at, or was taken to, a house near Windy Corner where he died. Guards Cemetery grew up near this house which was used as a Battalion Headquarters and Dressing Station. The cemetery was named after the 4th Guards Brigade who buried in it from February 1915 until it was closed in May 1916. It was enlarged after the Armistice by concentrating battlefield burials. 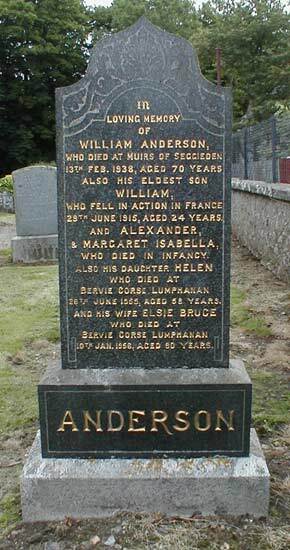 William Anderson died three months after his arrival on The Western Front. 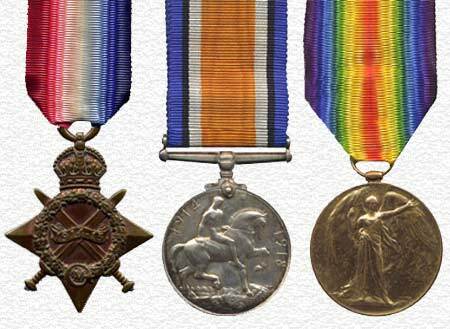 William Anderson was awarded these medals for serving his King and Country in The Great War. William qualified for the 1914-1915 Star (left). It was awarded to all personnel (including naval) who served in any theatre of war between 5th August 1914 and 31st December 1915, other than those who had already qualified for the 1914 Star.